The venerable Moto Guzzi marque has celebrated yet another birthday. 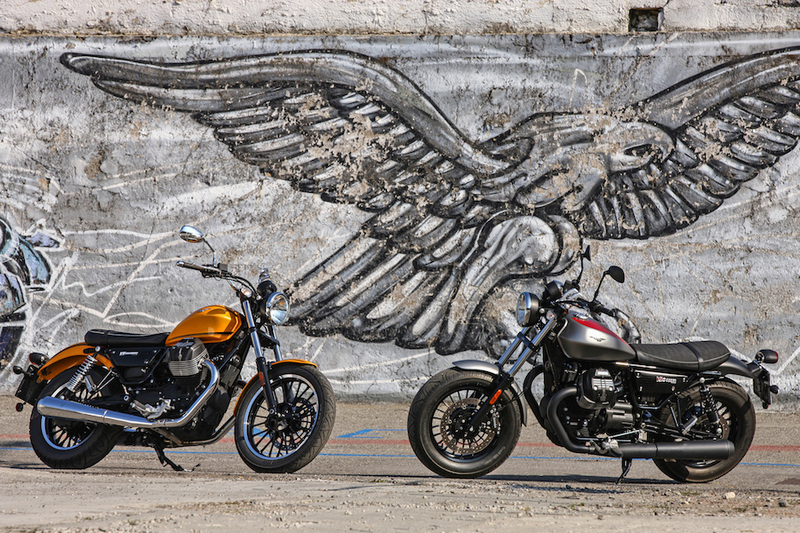 Italy’s oldest and most historic motorcycle manufacturer is now 95 and has marked the occasion by introducing a pair of new models under the V9 designation: the Roamer and the Bobber. In a range topped by the 1400 California, these sit somewhere in the middle – an intermediate step between the four-strong entry-level V7 models and the 1200cc Stelvio and Griso. 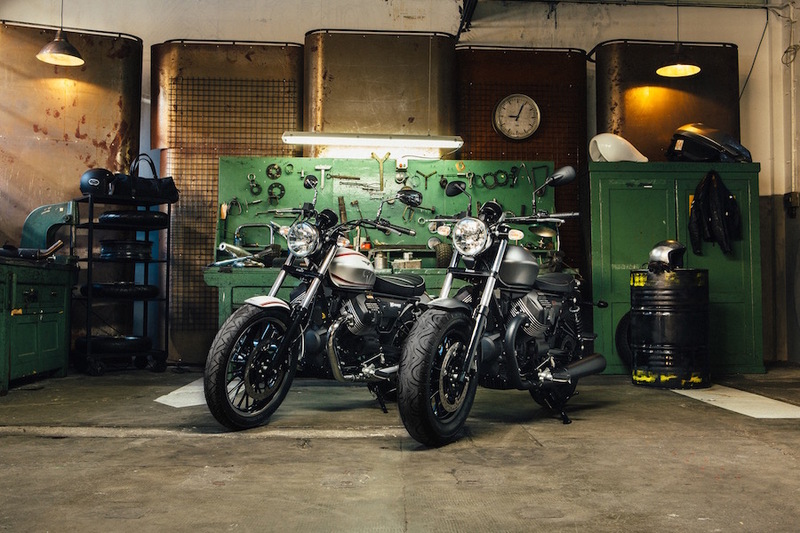 This new duo of cruiser-inspired shaft-drive V-twins are targeted at quite different customers, with the sharply styled V9 Roamer that’s available for a ride away price of $16,500 aiming to compete with the Triumph Street Twin, Indian Scout Sixty and Harley-Davidson 883 Sportster in serving the everyday roadster rider. With the same ticket price, the Bobber custom stylebike is a direct competitor to the Ducati Scrambler 800 in the lifestyle sector, and comes complete with an array of aftermarket accessories to help deliver its customers to the Land of Joy. 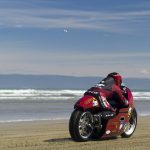 Their debut in the marketplace after being launched at last November’s EICMA Milan Show comes on the back of a 24 per cent increase in deliveries for Moto Guzzi in 2015, when it sold 7880 motorcycles – a good step up from the 6358 shipped in 2014 – and comes thanks to Guzzi’s Piaggio Group owner’s substantial Euro 31.4 million R&D spend on new models last year (and Euro 31.8 million in 2014) across its entire model range, including the Vespa scooters which have kept Guzzi and Aprilia afloat through all the recent hard times. Now the company is ready to take advantage of the current upswing in the global market, especially in Italy. To power the two new V9 variants Guzzi engineers have developed an all-new small-block engine to replace the one originally introduced in V35 guise back in 1977. That mill was best known for its use in the 750 Nevada for almost 20 years, though an evolution of it continues in production today to power the various V7 models. This new V9 motor retains Moto Guzzi’s traditional transverse 90º V-twin pushrod ohv format with air/oil cooling, but has all-new cylinders, heads and more robust crankcases, and 84 x 77mm dimensions for a displacement of 853cc, against the V7’s 80 x 74mm 744cc layout. Power of this Euro 4 compliant motor is now a claimed 40.44kW at 6250 rpm, up from 35.8kW at 6200 rpm in the V7 – which meets Euro 3 only. Torque is up too, to 62Nm at just 3000 rpm (against 60Nm). Build quality seems high on both models, with an emphasis on ‘real’ materials – plastic parts have been kept to a minimum. 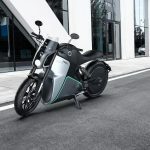 The front and rear mudguards are both metal, with the side panels, filler cap, non-adjustable brake and clutch levers, and forged footrests all made of aluminium. The stainless steel exhaust headers are also double-skinned, helping to lower the heat emitted and prevent discolouring. The two versions of the V9 share identical engine specifications and the same tubular steel duplex cradle frame, with a cast aluminium double-sided swingarm incorporating the shaft final drive housing on the right. This delivers a fairly rangy 1465mm wheelbase, with the non-adjustable 40mm Kayaba fork set at a 26.4° rake and offering 130mm of wheel travel, though the twin shocks from the Japanese manufacturer that are adjustable only for preload give just 97mm of travel at the rear. The Brembo brake package on both models features a single 320mm floating front disc gripped by a four-piston caliper, with a fixed 260mm rear disc and twin-piston caliper, and two-channel Continental ABS is fitted as standard. 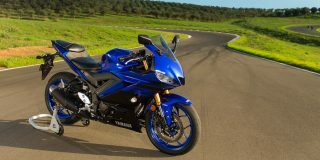 Both models also feature switchable traction control with a choice of two different settings, one for wet and one for dry riding conditions, giving newbies plenty of confidence for a safe ride, though with those relatively humble power and torque numbers, dry weather traction shouldn’t be a problem. So far, then, so similar. A 120km ride round to the opposite side of Lake Como from Guzzi’s Mandello del Lario factory took us over the challenging and evocative public roads Circuito del Lario road race course, which from 1921 onwards hosted the Italian equivalent of the Isle of Man TT. 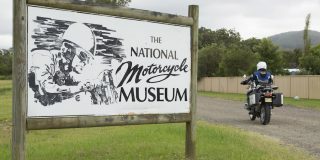 It was here that Moto Guzzi first made its mark in competition terms by winning five of the 15 such events ever run, including the final one on the eve of war in 1939. 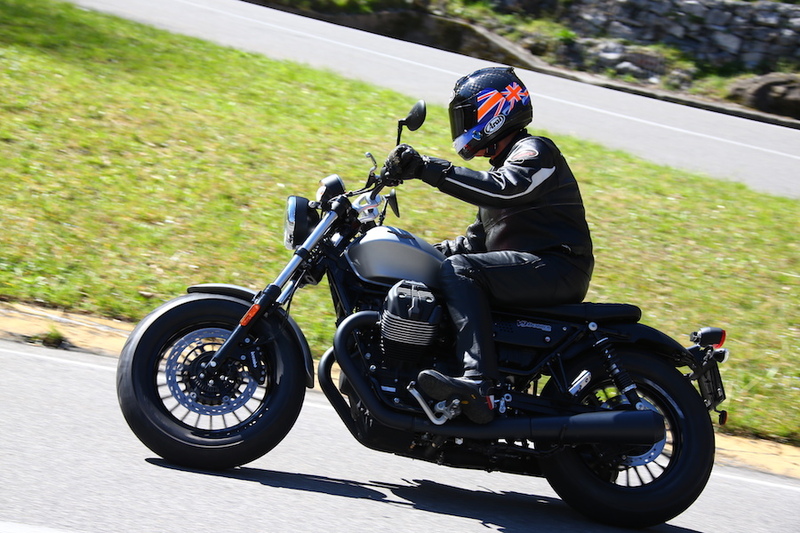 As we climbed 550 metres above Lake Como, the V9 Roamer lived up to its name, with its pulled-back handlebar and low footrests mounted only slightly forwards, delivering a comfortable stance that makes mile-eating a pleasure, especially allied with the torquey, willing nature of the new V9 engine. While devoid of undue vibration thanks to the perfect primary balance delivered by the 90º cylinder format – there are no balance shafts – this is also extremely quiet in operation, so much so that for the first time on a Moto Guzzi you can actually hear the shaft final drive’s rear bevel and pinion turning. It’s not so much a whine, more the mechanical sound of gears engaging. Before, there were too many rattles and mechanical noise from the pushrod motor for you to hear that, but not anymore. Indeed, the whole engine seems refined and well made; though its pushrod format stamps it as a thing of the past in design terms, its execution is thoroughly modern, and Moto Guzzi’s R&D engineers at the Aprilia factory at Noale deserve great credit for creating it for production at Guzzi’s Mandello plant. The light clutch made fighting rush hour traffic in Lecco easy and untiring – this will be a great commuter bike – and the shift action of the six-speed gearbox is much improved over previous small-block Guzzi models, though you must still always use the clutch, even for upwards shifts. There’s no tacho fitted to either model, just an analogue speedo with a digital panel offset to the left, so I can’t tell you exactly how low down the V9 motor pulls, but it has a very flat torque curve from around 2500 to 6500 rpm without a huge amount of grunt – you still need to use the gearbox to row it uphill, for example. Yet pick-up from a closed throttle is flawless, without the second gear jerkiness of the Ducati Scrambler. It’s worth noting that the digital box in the solitary instrument is illuminated so brightly that at night – or in a dark 2km tunnel carved through a mountain beside the lake – it’s hard to make out the small, closely packed numbers on the speedo surrounding it. Honestly, officer… That panel shows an odometer, partial and daily trips (with automatic reset eight hours after shutting down the engine), trip time, clock, instant and average fuel consumption, ambient temp, average speed, gear selected (hooray – it’s needed on a bike this torquey) and a shift indicator that’s adjustable by the rider. But it’s still too brightly lit. The V9 duo are very easy and forgiving to ride, which will suit inexperienced riders on their way up the capacity ladder, as well as shorter riders, including women. 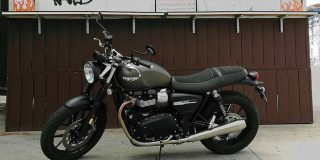 They’ll also welcome the fact that the Roamer’s low 785mm seat height (5mm lower still on the Bobber) allows people of most statures to put both feet on the ground at rest, thanks also to the way the seat narrows as it reaches the 15-litre fuel tank. Though the longitudinally ridged sides to the tank look like they might dig into your knees, that doesn’t in fact happen, because the footrest position means the knees of an average (1.80m) rider nestle just behind the cylinder heads peeping out either side of the tank. This is probably because the engine has been rotated slightly forward to make space, or else because of the longish wheelbase making room for the frame to be stretched. Whatever the case, it’s a well thought out riding stance with adequate footrest clearance when cranked over in normal use, and what looks like a rather plank-like seat in fact proved quite comfortable on our morning’s ride round the lake and into the surrounding hills. That, however, is where the two bikes proved very different dynamically, as we climbed away from the lake through a series of tight hairpin turns followed by a slightly faster succession of third-gear curves. Since the rolling diameter of the two models’ front wheels is essentially identical with the tyres fitted, there’s no difference between them on turn in, though the Bobber does have heavier steering. But while the Roamer steered very predictably, with good feedback from the skinny front Pirelli, you couldn’t say the same about the Bobber. This has a flatter, lower handlebar that asks you to lean slightly further forward, making for a more aggressive stance in keeping with its looks. 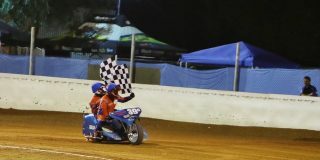 But that aggression is all show, not go, for the simple reason that it’s quite impossible to tell what the front tyre is doing in a turn – the deep sidewalls completely dial out any front-end response. So you just hope for the best in laying the Bobber into a bend. Make sure you’re no longer squeezing the front brake lever as you do so, and use the rear brake almost exclusively to slow you down in best American V-twin cruiser mode. It also understeered repeatedly on me in tight hairpin turns – though I’ll admit that could be because I was reluctant put too much trust in the fat front tyre that’s for sure a triumph of style over substance. The Roamer by contrast delivers both of those, and felt easy and predictable to ride. As well as the grippy Pirelli front tyre, the single front disc was probably a factor in that, because of the reduced un-sprung weight and lesser gyroscopic forces it delivers compared to a twin disc front end, while at the same time providing quite sufficient bite to slow a 199kg fully fuelled motorcycle into successive downhill hairpins without any sign of brake fade. It was also noticeable that the Kayaba fork’s damping settings gave good ride quality in absorbing road shock on the Roamer, but were not nearly as compliant on the Bobber, presumably due to the fatter but also heavier front tyre. Pirellis are renowned for being the lightest volume production tyres in the marketplace, so the Continentals would be likely to start with that handicap in relation to the non-adjustable fork, even before the extra weight of the 16-inch front came into the equation to compromise the damping. 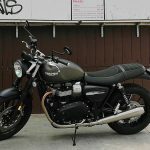 But on both bikes the reduced rear wheel travel compared to, say, the Triumph Street Twin with an identical Kayaba suspension package, meant that most of the Italian road imperfections got transmitted to the seat. Ride quality felt very ‘dry’. What the Bobber’s handling problems when pressed tell you is that it’s a question of horses for courses. It’s probably unfair to criticise a hey-look-at-me stylebike for not being able to cut it on a former public roads racetrack, so since customers for such a bike will probably buy it primarily for urban use, where most corners it’ll come across will be right-angle turns in city streets, I’m sure it’ll be perfectly at home there, especially with the extra cushioning in the sidewalls to absorb road shock from riding over man-hole covers and the like – while looking cool doing so. 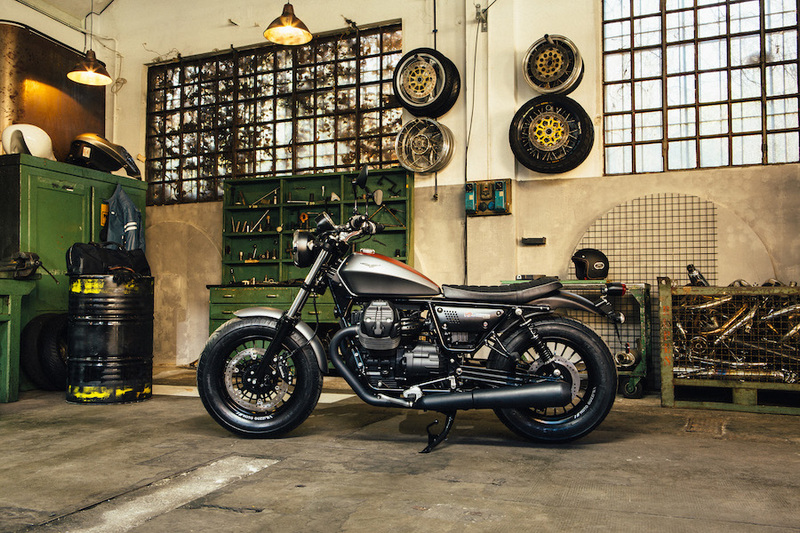 For anything else, potential Guzzi V9 customers can opt for the Roamer. 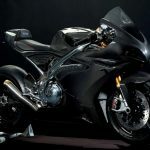 The 800-900cc twin-cylinder retro/lifestyle model sector is getting pretty crowded these days, with entries so far from Triumph, Norton, Indian, Harley, BMW, Yamaha and Ducati. 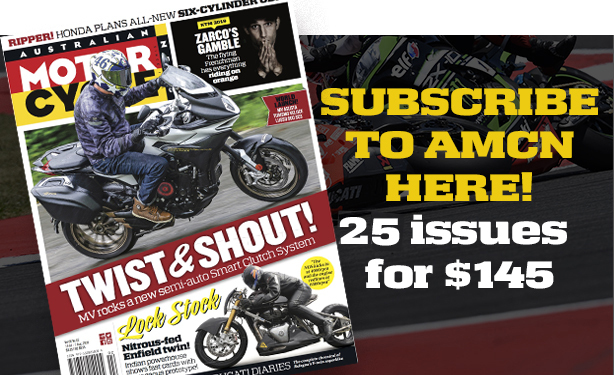 Thanks to the well-made and thoroughly modern platform provided by their new 853cc engine, the Moto Guzzi V9 Roamer and Bobber are certainly valid contenders for the customer dollar, and as always with anything Made in Mandello offer something completely distinctive in the process – even more so in the case of the Bobber! Moto Guzzi has fitted a new lighter single-pin crankshaft, and revised the wet-sump lubrication system to include oil jets for the now slightly domed pistons to cool the engine better. Those pistons are new, too, and not just because of the V9’s larger diameter bore. Previously, the small-block Guzzi engine used the Heron head design first brought to motorcycling by Moto Morini 45 years ago on the 3½. This has the combustion chamber recessed in the piston crown, thus aiding combustion and enhancing fuel economy, leaving the cylinder head machined flat, with parallel valves. For the V9, Guzzi has moved to a more conventional hemispherical head design, each still with two valves and a single sparkplug, with the compression ratio now raised to 10.5:1 instead of 9.6:1. While the single camshaft is still located at the base of the cylinder vee, new rocker arms operate the now splayed valves, though adjustment is still via threaded adjusters at the rocker arm, similar to the V7’s set-up. The V9 engine also has a new low-flow oil pump that requires less power to run, as well as a revised crankcase ventilation system to reduce pumping losses. Specifically developed for use on this type of engine, the new generation Magneti Marelli MIU/Mechatronic Integrated Unit ECU is matched to a single central throttle body feeding both cylinders via a Y-shaped inlet manifold, same as on the latest edition of the Heron-headed V7. Together with an auxiliary air intake system, a three-way catalytic converter in the exhaust, twin oxygen sensors – one for each exhaust pipe – and the total redesign of the engine, this allows the new Moto Guzzi 853cc engine to meet Euro 4 emissions standards. Also fitted is a new single-plate clutch with a 20mm larger diameter at 170mm, and revised actuation to make the pull easier. This is matched to a modified six-speed gearbox with taller bottom and sixth gear ratios. In addition, the shaft final drive has a second universal joint to make room for a wider 4.00 x 16 rear wheel, so the swingarm side holding the shaft is angled outwards instead of leading straight back off the engine, to make room for a wider rear tyre, yet while still keeping the rear of the engine compact. An optional multimedia platform called MG-MP is available for Moto Guzzi V9 Roamer and V9 Bobber riders. 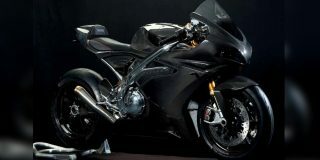 It’s an innovative multimedia system which allows you to connect the bike to your smartphone, and thus to the web. With this application, downloadable free from App Store and Google Play, your smartphone (both iPhone and Android) becomes a sophisticated on-board multifunctional computer, providing a link between your motorcycle and the Internet. Moto Guzzi provides a mounting clip for you to carry your smartphone on the bike. The wireless connection then allows you to simultaneously view a set of vehicle information on its screen, so you can keep a constant eye on a variety of travel parameters. The smartphone’s touch screen allows you to view any five of these at a time, depending on your choice, selected from a vast menu which includes the speedometer, rev counter, instant power available, instant torque available, instant and average fuel consumption, average speed, battery voltage, longitudinal acceleration, and an extended trip computer. 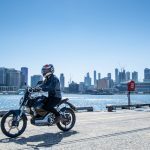 The so-called Eco Ride feature helps to limit fuel consumption and to maintain what Moto Guzzi calls ‘eco-compatible’ riding conduct, providing a brief assessment of the results obtained during your trip. You can record trip data and review it on your computer or directly on your smartphone, analysing the distance covered along with the bike’s operating parameters. The system also allows you to easily locate your motorcycle when you park it in a strange place, automatically saving the position where it was last switched off. 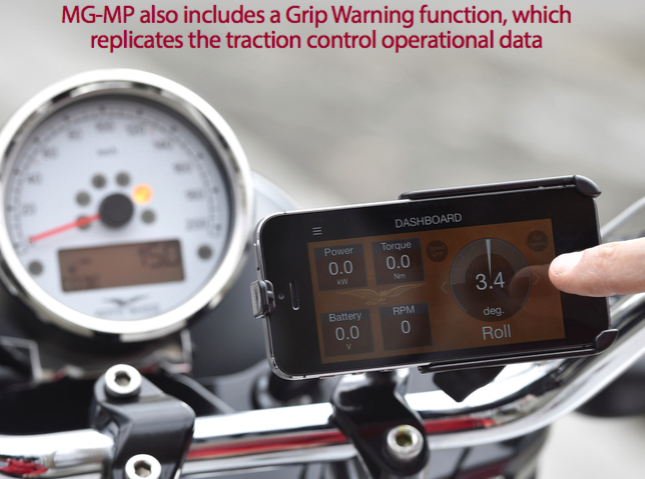 MG-MP also includes a Grip Warning function, which replicates the traction control operational data and provides real-time information on road surface conditions. A dedicated indicator light warns in the event of excessive use of available grip. Thanks to the synergistic use of gyroscopes and the data supplied from the motorcycle, the smartphone becomes a sophisticated instrument to measure the lean angle in turns thanks to algorithms developed specifically for Moto Guzzi. The limit thresholds can be set both for lean angle as well as vehicle and engine speed. When these limits are exceeded the relative indicator lights will come on or the virtual dashboard will flash.